Jaehwi: Hi everyone. Welcome back to Korean Weekly Words. I am Jaehwi. Let’s see what we have for this week. 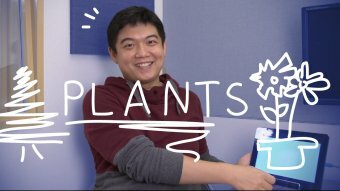 The topic of the week is plants. Next we have 잎 (ip) which means “leaf.” With that word, you can say 떡을 만들 때 떡 사이에 솔잎을 넣습니다. (Tteogeul mandeul ttae tteok saie soripeul neosseumnida.) which means “When making rice cakes, you put pine tree leaves between rice cakes.” Because you know without anything between the rice cakes, it will just get together because it’s too sticky. Hi. Is the romanization for flower is really kkot or it should kkoch? Looking forward to seeing you often here! Thank you for your comment. The PDF lesson notes are updated.